Awesome video. Looks like you guys had a good turn out. Practice, Practice, Practice / Re: Help: How to increase speed and lean angle in practice? this vid worked out great for me except one thing. unless i crank up miss piggy's idle i cant take my hands off. that big v-twin lurches at low speed and makes it feel like your chopping the throttle. What do you ride? Sorry if it's been answered before, I didn't see it. I ride an SV650N these days and found that second gear really helped me get used to how the engine behaves at near-idle because it smooths out that lumpiness. Not to mention that the SV pulls like a tractor right off of idle, even in second gear. I haven't adjusted the TPS yet like I should - heck, maybe I'll do that today. Once I got (am getting) more comfortable with second gear pulls, I went back down to first and found that I was far more confident with the bit of lumpiness at or very near idle. I've also been pushing myself to keep it off of idle if I can when performing 180's, dragging the rear brake some while keeping the throttle cracked slightly. Yeah, it leads to a hot rear brake, especially if you're out practicing for two or three hours, but I think Sintered pads may help with that some. Admittedly I've not tried taking my hands off of the bars yet; old teachings and old habits die hard; Keep your feet on the pegs and your hands on the bars. To be fair, it looks like he's running racing slicks which are incredibly sticky and wouldn't be street legal in most places. The performance due to the choice of tires he's using over the choice of tires that (I think) most of us are using isn't even comparable. The size of that rear sprocket to get incredible drive out of the corners, paired with those tires, is a recipe for sticking to pavement like a gecko. I would also argue that his rounding of those corners may not be as fast as they could be, but he's got the drive and tire for the lean angle to look impressive. I personally run Dunlop Roadsmart Sportmax on my SV650 and Pirelli Sport Demons on my CB700SC. Neither tire choice, despite being extremely suitable for street and intermediate track riding, would instill enough confidence in me to try what he's doing with the glue that that he is using for tires. I've been learning over time that mastering the 180 maneuver doesn't necessarily mean being cranked over with the bike so much that you're ready to drag knee, but to be smooth and let the bike do the work. There is certainly a maximum lean angle at which the bike will self-balance at a given speed while at full lock as shown in the previous video with that GSXR, but remember one of the first key, universal rules that you learn when riding; You are a movable counterweight. As a a counterweight, you can keep the bike up when it wants to fall in. The GSXR rider displays that well, I think. You can actually get lenses for the GoPro that reduce the FOV and fix the barrel distortion (fish eye). That might suit your needs over buying a new camera. They only run $30-40 and as I understand are an easy swap. Introduce yourself / Re: Greetings from a SoCal Gymkhana rider! Yep. Thanks for bringing this community back in to the forefront of my scatterbrain! I've updated my info and will be seeking out local riders. I reclaim cones that I find on the side of the freeway after a few days of seeing them in the same spot with one caveat, I won't touch branded/marked cones. If they have a logo or ownership seal like "CALTRANS" on 'em, I simply turn them right side up and leave 'em be. Yeah, I guess that makes me a goody two-shoes. Now that I'm riding full time, it's a bit harder to collect them. Oh well. First world problems. Video & Pics / A reminder why engine/frame/radiator guards are important. Trying to get the hang of the 180 degree turn with my new bike after fighting with 8's for a while, first time out practicing with the SV. I was hot, worn out and down she goes. No damage except for a slightly tweaked clutch lever, but they're a dime a dozen. Thank you, Motosliders, for protecting my big ol' goofy wide radiator and shift lever. Not to mention my tank and tail section. Without a pair of even simple sliders like I have, it looks like I would have damaged the radiator, tank and tail section. Our Japanese brethren have some outstanding frame protectors for the sport; Sport Bumpers as they're known, but they are prohibitively expensive at about $700 USD for the cheapest pair I've found (That's a third of what I paid for my bike! Or half of a month's rent. Or nearly all my monthly bills added up. Ugh, stupid bills.). I'm actually currently working with a local cart racer and fabricator buddy of mine to begin making some US-made sport bumpers for just this reason. But for now, we work with what we have. MotoSliders make an outstanding product and in one down they've already paid for themselves in prevented damage. This is a screen capture from the video of the incident. It is so sad to see a bike on it's side like this. It's like seeing a turtle on its back, waving those tiny little feet around. Yes, I'm strange, I know. I love seeing the guys on the big, heavy sport touring bikes doing their thing. Thanks for posting the video. 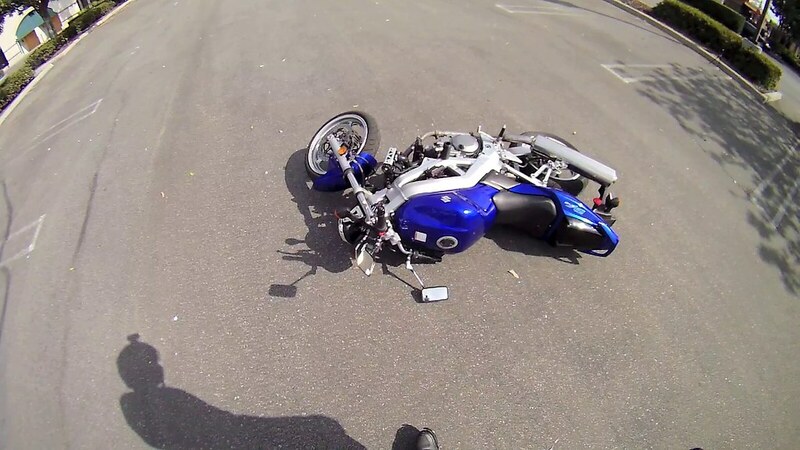 Video & Pics / Re: Supermoto Practice Leads to High Side Crash - Rider knocked unconscious! Yikes, that's some seriously bad news. Really happy to hear that you're doing ok, though. Every time I see someone doing Supermoto stuff it's like an invitation to a high side crash. It's pretty amazing that it doesn't happen more often given the gnarly physics you guys are fighting. Here's to a quick recovery, quick repairs and getting back out to doing what you love to do! I have no times on my Nighthawk which I have pretty much all my Gymkhana experience on and am very comfortable and fast(IMO) on, but my best 8's time today that I timed was 82 seconds. Using my new SV650, mostly unfamiliar with the response of everything at these low speeds. Wasn't really aiming for a fast time, but more to try and figure out how everything felt. But, I'm not embarrassed to say that my first run out with my new bike was 82 seconds. Time to work on cutting that in half. Great head turn, but notice that although the eyes are pointing the right way, the head has got a bit to go. As your bike always goes where your nose is pointing we need to find a technique that will help us to turn our heads more so that we can turn the bike quicker. We need to get those shoulders out of the way, so we do this by rotating our upper body in the direction of the turn as well. in order to do this our elbows need to be bent a lot more which means our upper body will have to be canted forward to let them bend. A good exercise is to stand with both feet touching one of the lines in a car park and then rotating our head through 90 degrees. You will notice that in order to save straining our neck everything has swivelled from our ankles, to our knees, to our hips and finally to the shoulders. Try the same exercise only this time sitting on the bike. There will be a fair bit of shuffling and shifting needed before you can comfortably swivel your head around, but you will soon find a position which works. Try the same exercise only this time with the bike moving, you'll find that all your turns suddenly become much easier and quicker. Great technique with just the middle finger on the front brake lever. This saves us from putting too much pressure on the brake and frees up the index finger for controlling the throttle. Thank you for the suggestions. I think at the time that was all I could get out of my head-turn due to how stiff that jacket is, but I'll certainly give your suggestions a try since I was rotating from the wrong spot. Part of my one-sometimes-two-finger braking technique simply stems from the fact that the brakes on my Nighthawk are fantastic. Lots of very controllable power from a little bitty squeeze. Early on in my riding years I quickly figured out that most times a 4-fingered braking approach leaves me with less control and finesse. Especially practicing Gymkhana. I'm happy to know that I'm doing it right! She def knows what she is doing. 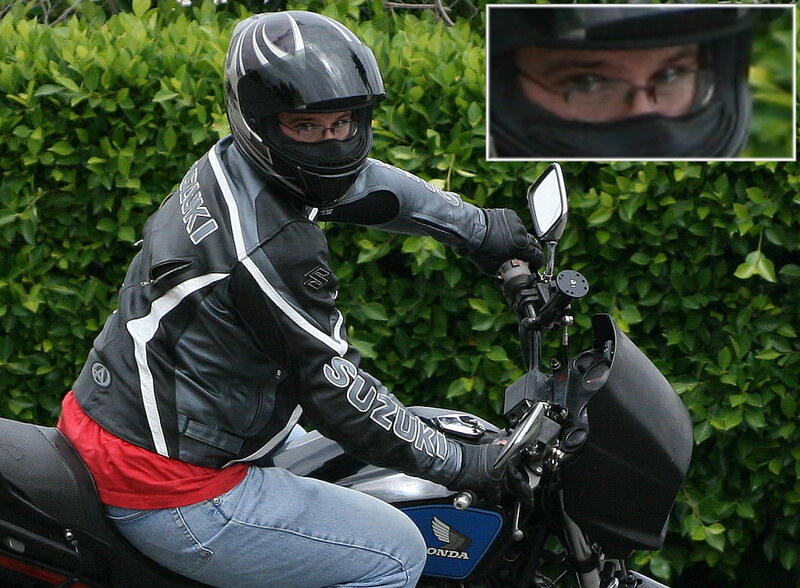 My picture is of me on my Nighthawk from a year or so ago. The lady in the video is at a competition in (I'm assuming) Japan, and yes, riding a ZRX. The book is on its way, but I have decided to do a lot of modifications to it now that we have riders of all levels of ability from novices right through to experts popping up all over the world. Have decided to change the format from a how-to, to a series of exercises that if performed correctly, will give the desired outcome. I have decided on this change as riders from different countries have all been taught different things (some good, some bad) and so I have had no real baseline to work from. Another reason for doing this is so that we can have a consistent structure throughout the world so that Instructor training and school setup can be made a lot easier. Thank you for all your hard work. Do you have any idea when we might be seeing the first release? General Discussion / Standard practice and techniques? Much to my own disappointment I haven't done much with learning Japanese yet, so it sometimes makes it hard to browse through Japanese Moto Gymkhana sites and understand what's going on. I'm curious if someone is aware of a website or websites that may have sets of common practice techniques, practice layouts, goals, etc... I've seen such a wide and varied mix of videos from several people that I follow on YouTube that I find it hard to believe that nobody has put pen to paper with the same enthusiasm that this fledgling movement we have going here outside of Japan to teach and show others. Or is it really rooted mainly in word of mouth and hands-on teaching? I had also read that when laying a course out that it is important to include certain Gymkhana principals and to use all of the specific obstacles/techniques one finds in Moto Gymkhana, but not specifically what those obstacles/techniques were. I had also seen somewhere that there was a "course catalog" coming from somebody? I could just throw cones down and create a random pattern in my head, which I've done before with varying success, but I want to make sure that if I'm working on bringing others into the community that I'm giving them the correct initial impression of the sport as well as common and practical knowledge that we all use. GP8 is about the only rock solid standard that I know of. Are there actual standards that we should adhere to, even loosely? This young lady on the Zrex is very impressive; I've seen her ride before (at least I think I have) and top notch control all the way. She looks to be doing what I would consider standard "look where you want to go" technique that we as riders should be using in every day life, everywhere we ride. If you're looking at the ground, you're going to end up on the ground, but if you're looking towards your next turn or obstacle, then bike will (in my experience, quite effortlessly) end up going right where you are looking. I did a small photo study of myself early on from last year that I called the "Look!" series to study how I was composing myself, where I was looking, etc... and found myself time and again looking so far over my shoulder towards the next obstacle that I couldn't actually turn my eyes or head any farther. This is definitely a technique we would want new riders and new Gymkhana riders to be aware of and practice religiously. I'm definitely going to try incorporating in some background features into the way I look through courses, though. It isn't often that I get lost in my own sea of cones, but it happens.